An exciting and varied journey through the ancient heartland of the Aztecs, Zapotecs and the Maya. From the foodie hub of Oaxaca in Mexico to the jungles of Guatemala, explore charming colonial towns and discover ancient sites including Palenque and Tikal. Some departures have been set to coincide with Mexico's Day of the Dead Festival. Today we journey through the mountainous Sierra Madre range, stopping to visit the 2000-year old swamp cypress tree in Santa Maria del Tule just outside Oaxaca and continuing to the Mixtec/ Zapotec site of Mitla where we will have a short exploration of the ruins. Our destination this evening is the hot and windy isthmus of Tehuantepec, a convenient stopping point on our journey towards San Cristobal. Today we visit Tikal, the great Maya metropolis set in the midst of the rainforest, which can justly be compared with the celebrated ancient cities of Egypt and Greece. Initially settled in about 600BC, Tikal was abandoned by its rulers around 890AD and totally deserted a hundred years later. The city covered an area of 16 square kilometres. Re-discovered in 1848, only a few of its great temples and pyramids have been excavated. The site is extensive, so we include a guided tour in the morning followed by free time to let you explore. We can appreciate the prolific birdlife in the surrounding rainforest and take in amazing views of the forest canopy from the tops of the pyramids. We drive back to Flores at around 3.30pm. This morning we drive to Belize City where the tour ends. It's well worth extending your time here and Explore have a 7 day extension that includes a stay on the beautiful Belizean island of Caye Caulker, as well as a trip up to the Yucatan Peninsula with a visit to the famous Maya site of Chichen Itza. Search for the trip code MXY for more information. so don't overload yourself. Please note that in the Yucatan luggage is stored on a roof rack and you must be able to lift it. 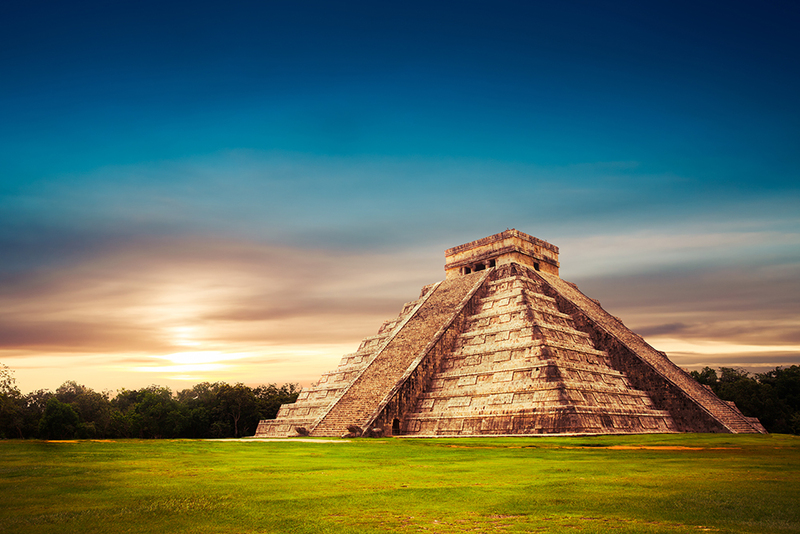 Why not extend your trip with four nights on Mexico's Yucatan Peninsula, including a visit to the famous Maya site of Chichen Itza. Click here for more details.